Sure enough, the former stand-alone section occupied all of four Metro pages that featured – Motheragawd! – exactly zero ads. 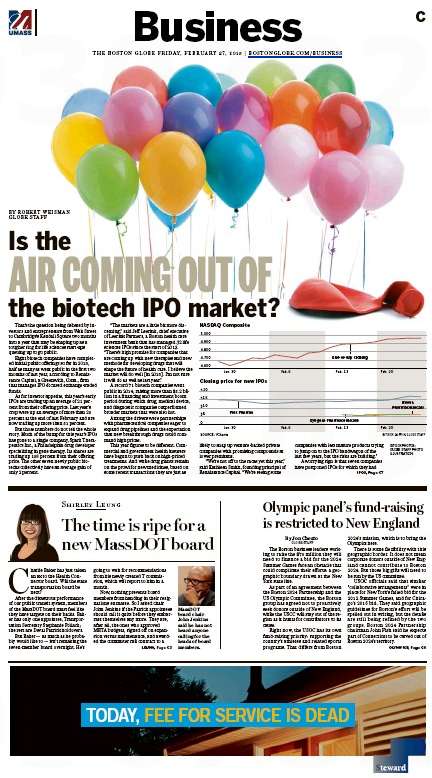 As one splendid reader pointed out to us, the mainstay of the old Capital’s ad pages – Steward Health Care System – had drifted over to the Business section, formerly a wholly owned subsidiary of UMass. Granted, UMass still has the bug that keeps on bugging nestled in the Business banner, but Steward owns the bottom of the page. Should be fun to watch the Steward-UMass slap fight in the stately local broadsheet. At least until 2016, when – who knows – Capital might stand on its own two feet again. This entry was posted on Friday, February 27th, 2015 at 12:59 pm and is filed under Uncategorized. You can follow any responses to this entry through the RSS 2.0 feed. You can leave a response, or trackback from your own site.